Native pollinators—bees, butterflies, moths, bats and birds—play a critical role in sustaining ecosystems and provide essential services to American agriculture (estimated at as much as $9 billion annually). Yet pollinators are in trouble. More than 50 native bees are in documented decline, with nine critically imperiled, including the Franklin’s bumble bee. Another iconic North American pollinator—the monarch butterfly—is in severe decline, down from a billion monarchs 20 years ago to 35 million today. Research shows that native pollinators can be two to three times as effective at pollinating agricultural crops as non-native honeybees. Special Value to Native Bees – Attracts large numbers of native bees. Special Value to Bumble Bees – Attracts large numbers of bumble bees. Special Value to Honey Bees – Important pollen or nectar sources for honey bees. Provides Nesting Materials/Structure for Native Bees – Plants that native bees nest beneath, within, or harvest parts from to construct their nests. Supports Conservation Biological Control – Plants that attracts predatory or parasitoid insects that prey upon pest insects. Milkweed Finder – Find Sources of Native Milkweed Seed in Your State. 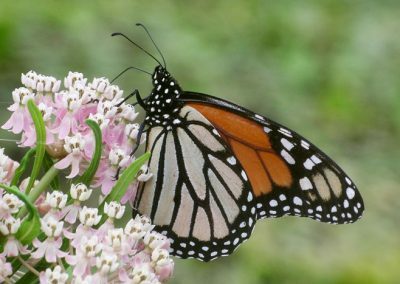 Milkweeds: A Conservation Practitioner’s Guide – Plant Ecology, Seed Production Methods, and Habitat Restoration Opportunities. Presidential Memorandum – Creating a Federal Strategy to Promote the Health of Honey Bees and Other Pollinators (June 20, 2014). Supporting the Health of Honey Bees and Other Pollinators – Guidance for Federal Agencies on Sustainable Practices for Designed Landscapes and Supporting Pollinators on Federal Landscapes (October, 2014).